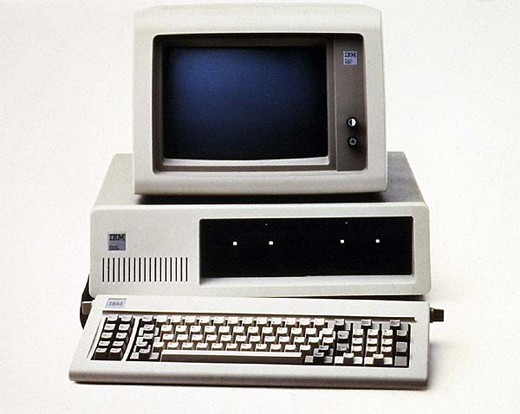 The 1982 IBM PC… Thankfully things have changed. After I had finished writing my Power article, I debated about what to follow it up with. Do I follow it up with Motherboards or Cases or maybe even a beer? Well After I had my beer I decided that the thing to do would be to look at cases and in particular their design and the functions they fulfil. Not all cases are created equally and with each distinct computer class, there are a range of cases priced to suit the pocket of the individual buying them. Building your own computer should be a prideful thing. A demonstration of your creativity and your personality, although the office is still the preserve of the beige box it’s been a long time since IBM released the beige box to the world and now that box has evolved into a range of shapes and sizes that are almost as individual as the person who owns the machine. As with all things electronic you do get what you pay for. Like a bespoke piece of furniture your computer can make a statement about you as a person be it the care dispensed in the selection of its parts right down to how they are presented. Some people however, didn’t quite get the memo…..
Needless to say that in the PC world there are plenty of disasters when it comes to cases and case design. 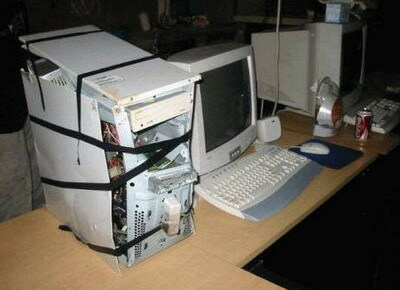 Unfortunately, for most people a PC remains a simple box with cables pouring out the back. A device whose form follow’s the function irrespective of where and how it is used. Imagination is something that generally isn’t brought into most people’s equations when purchasing something that is technically a commodity item. But desktop PC computers can be a thing of absolute beauty and even wonder in the right hands. Combining standardised components with a customized design can result in a little slice of electronic perfection. Machines like the Edelweiss Computer are not simply built, but designed with absolute care, precision and dare I say it even.. Love. A PC no longer has to be a grey box that sit’s under a screen, systems like the above are almost an art-form. But as an art-form they are made by only a handful of individuals who have the technical skills to manufacture not just the machines but their housing. For us mere mortals, we have to settle for cases that may not be quite so artistic, but that doesn’t mean that they have to be any less spectacular. But for all machines bought, or built we have to start somewhere and that starting point is almost always; what is the function of the computer? The answer to this question will help dictate the computer’s form. A Server is a machine that isn’t designed for a typical home setting, though there are quite a few homes that do have one. Servers are designed to be housed in data centres or small offices and are designed to offer ‘services’ to other machines in that office. These services could be storage, printing, database’s or just plain network services. Given that these machines are designed not so much to be seen they can be fairly industrial in appearance, and aren’t noted for being quiet. They are however available in a range of sizes and styles depending on their setting. The first thing that you’ll notice about this machine/case is the fact that it is not immediately obvious where the CD/DVD drive is, or where the USB ports are (all these are actually hidden behind the Dell labelled face plate). The case is also very industrial, its a significantly large metal box it is approximately 19″ wide, which is in fact a standardised width. Machines this wide are designed to installed in a Server Rack. This server is also 2U, a U is a reference to the standardised storage or space units that this server will occupy. For the most part The average Server Rack can house approximately 42U and are more than 6 feet high. An engineer maintaining a 1U server. It’s not just the external appearance of these systems that are quite different. The internal component arrangement is very different from a traditional PC. For the most part they contain same/similar components as a standard PC, a processor, Power Supply, RAM, etc… Except that in a server many of these features are doubled or even quadrupled. Lets have a look on the inside. First of all, lets get our bearings with this image. The front of the server is to the right end of the image, the back is the left. You’ll notice that approximately 1 third of the front of the server is a large metal plate on the right side, underneath this lie the disks that are installed in the machine. Typically servers of this size have around 6 Hard Disks. They are usually organised in a structure known as a RAID (Redundant Array of Inexpensive Disks) Array. I will be covering RAID specifically in another document, but the best way to think of it is that each of the 6 disks stores a part of the other disks. All the Disks work in parallel too meaning that each server can read 6 times and write six times the usual amount of data only a single disk could manage. Immediately behind the metal plate you’ll notice a collection of small black box-like objects. These are high speed fans, that draw cool air in from the front of the machine to cool the disks and also the components that sit behind the fans. The third part you’ll notice are the CPU’s, this machine has four although only the heat sinks of two of them are obviously visible. The heat sinks are the copper coloured blocks of metal, while the other two processor heat sinks have a black bracket over the top of each of the remaining two heat sinks. Finally in this image you’ll notice that at the back of the server in the top left side corner there appears to be a small metallic box. Into this area are housed two power supplies that may be rated up to 1,000 Watts. The idea is that both supplies are plugged in, so that if one breaks the other supply can generate and supply enough energy without interruption, to maintain the server should one of the PSU’s become faulty and need to be replaced. Certainly with so many high speed fans, and so much heat generated by the processors; one thing these machines are not is quiet. 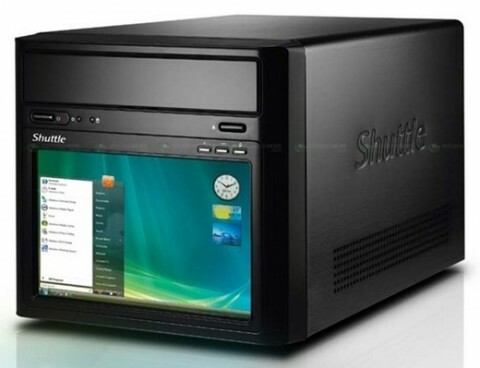 Servers of course, are not just restricted to rack mountable systems, some are even available in desktop form factors. But most of them enjoy the same/similar sets of features. 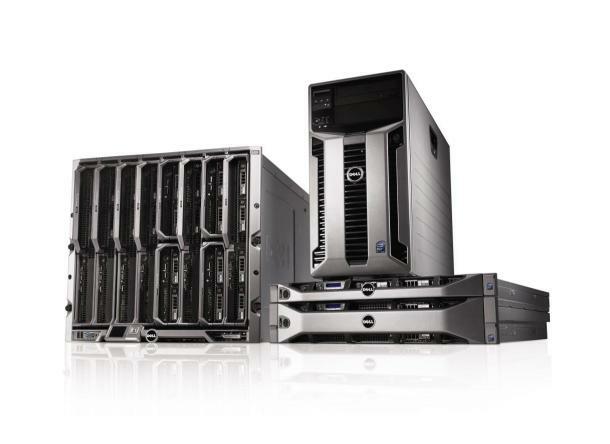 A selection of Dell servers. 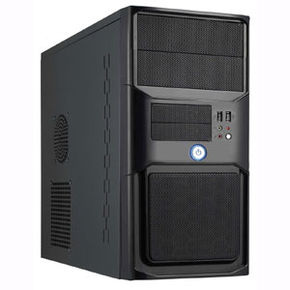 As you can see above, we have a desktop style server, probably suitable for a small office setting, under it lie a 1 U and a 2 U server that are more suited to larger businesses/enterprises. 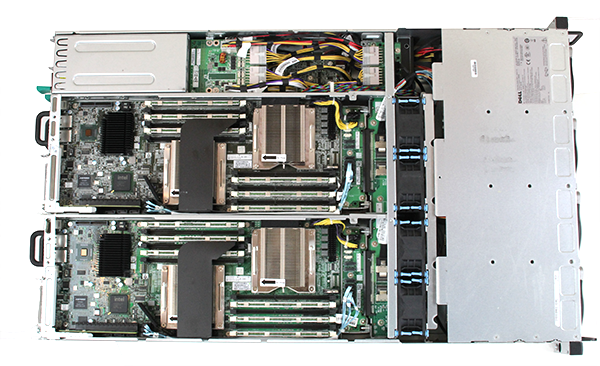 And to the left is a blade server chassis that can contain around 16 servers in a single chassis, machines like the blade chassis are generally reserved for enterprises and offer the ability to house a greater density of processing capability in a smaller space. As I said above in my opening paragraphs, the forms of these machines are very clearly defined by the function. The same is true of desktop systems. It is possible to construct a machine that is damned good at just about everything that you could wish to apply that machine’s resources to. Such systems do tend to be large because they require specialist hardware to fulfil the more sophisticated tasks. You may wish to make a system specifically for your living room designed to record TV shows, play movies and music. This could result in you selecting a smaller profile computer. 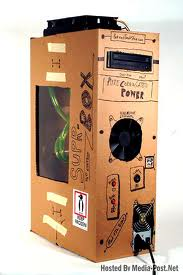 If you are a gamer you may wish to construct a machine that offers maximum flexibility. Very few applications can fully tax a computer like a game can and as such these machines tend to be of the larger variety because of the hardware requirements and not least of which the Power requirements. Lets start by looking at the lower end of the market and we’ll work our way up to the higher and larger end of the market. We’ll start with the general purpose living room media PC also and more popularly known as the HTPC or Home Theatre PC. Home Theatre PC’s generally require lower power components and certainly do not generally require exceptional Graphical Processing capabilities, but what they generally require is a Blu Ray drive for HD movies, possibly a TV tuner, at the very least one large hard disk sometimes supplementing an SSD. They usually don’t require high end CPU’s because they do not need to manage the same degree of data processing that something like a games PC would. These machines also generate less heat as a result of their lower power components and this makes it possible to construct them in a smaller housing. 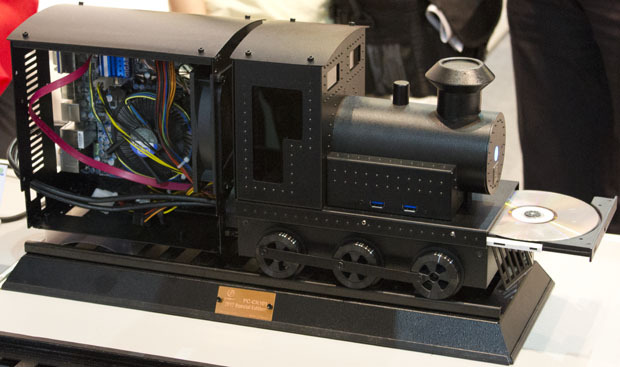 Mini ITX represent the smallest of the small. 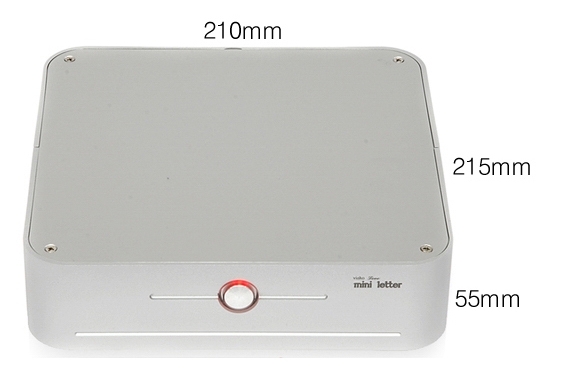 These cases represent the absolutely smallest possible form factor for a fully fledged PC. For example the slot at the base of the computer in this image is in fact the Blu Ray drive. These devices are small enough that they do not attract attention and yet can house a processor, RAM, hard disk and a sufficiently sophisticated integrated graphics card to meet the requirements for movie playback. They also feature an integrated sound processor that is sophisticated enough to generate 7.1 audio. However due to the extremely condensed profile of these machines, their expansion potential is seriously compromised. Additionally the components they can house also tend to be extremely low power. For example, if you wish to watch TV or use this device to record TV then you are relying on one of two potential options. First that the functionality is already integrated into the device or; secondly that there may be enough space in the device for you to install a TV tuner. For the most part, neither is likely. Fortunately TV tuners can be purchased as network or USB devices, though there may be an insufficient number of USB ports available on the ITX based computer after a keyboard and mouse are attached. These machines are extremely portable, and are an excellent option for a living room, they can be hidden but even when visible, they are hardly going to draw your attention away from whatever you are watching. Even then these cases are not limited to a simple metal box. 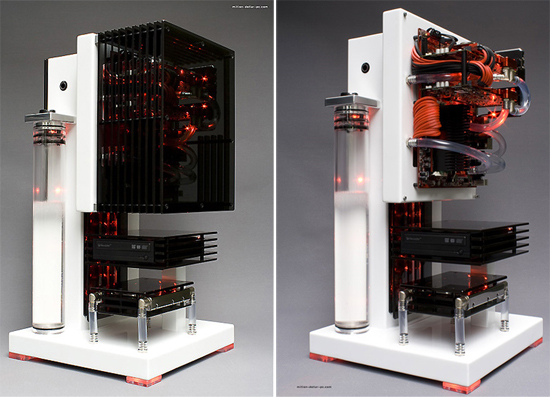 In fact Mini ITX cases come in a range of designs, some of which are quite frankly insane! Micro ATX machines offer a slightly larger form factor than ITX. They also offer small compact case form factors without compromising the performance of the computing components that can be installed. Although expansion potential is limited, you can in fact add in specialised cards that can meet different demands, even gaming. 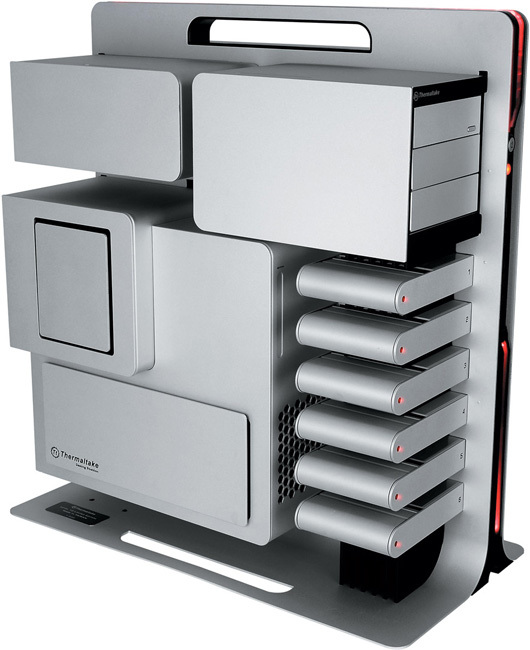 As you can see these machines offer a much larger case profile, but are still relatively compact. These machines even incorporate a couple of full length PCIe3 slots that enable you to install a full length video card. This opens up the potential of these machines to act as gaming systems. They can also accommodate higher power CPU’s and have just enough space to accommodate sufficient cooling systems to manage and dissipate the heat build up generated by the components. As with the Mini-ITX machine above even these cases are available in a range of sophisticated options. A Micro ATX case with a touch screen display. A quite astounding piece of technical engineering, this Micro ATX case features an integrated touch sensitive display. To give you some idea of the scale, if we look at the top of the case you will notice a rectangular metal plate, that is where the Blu Ray drive is situated. The integrated touch screen is barely wider than a Compact disc. ATX form factor cases tend to be the most common, the most diverse and at the same time the one’s that have the least amount of imagination applied to them. For the most part they are a box with cables coming out the back. Dullsville.. Basic PC housing and that’s about it. There is not very much to this case, and realistically it is indicative of the lower end of the ATX case market. Firstly, lets look at the fascia of the case, there is a large square mesh area occupying the lower 35% of the of the fascia. This will have a fan behind it for sucking air into the case to cool components. If we look at the left side of the case you will notice a number of holes cut out into two shapes, the one on top is circular, the one below is Square. You will also notice that there are four obvious holes in the corners of each of these drilled out areas. These exist to allow you to install optional fans in those areas to increase the intake of air to cool the machine. They are optional and aren’t included in the basic case accessories. Most cheap cases also incorporate a PSU, they tend to be extremely cheap PSU’s and aren’t rated sufficiently highly to power most modern machines. Interestingly most of the more expensive cases do not include a PSU. This helps contain costs, but is also reflective of the fact that people who purchase more expensive cases are generally housing higher power components and will have selected an appropriate supply for their needs. As you can see even a dull case can be modified to inject excitement into the design. However, the basic shape is pretty much the same. It is a box, with cables pouring out the back. However there are many options available if you are willing to spend some money. The Limited Edition Level 10 Silver. There are only 300 of these in the world. This is the case that houses my computer, the very computer I am typing this article on. 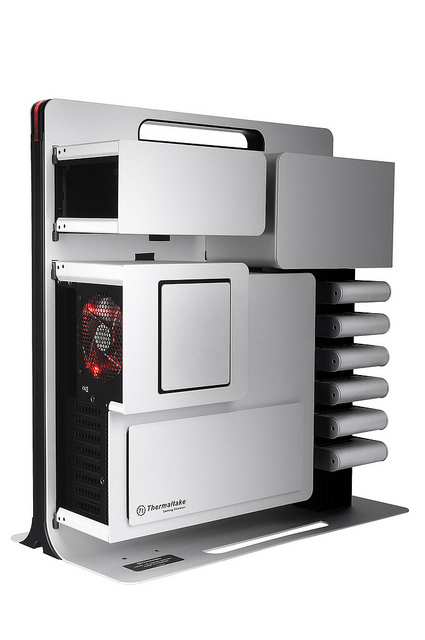 Much like the Edelweiss machine its components are separated into self contained compartments, each compartment is ventilated not by optional fans, but supplied fans. It is dramatic looking but it was also available to the ordinary consumer. I say was because this case was a strictly limited production run and while there may be one or two still available somewhere, only 300 of them where ever made. 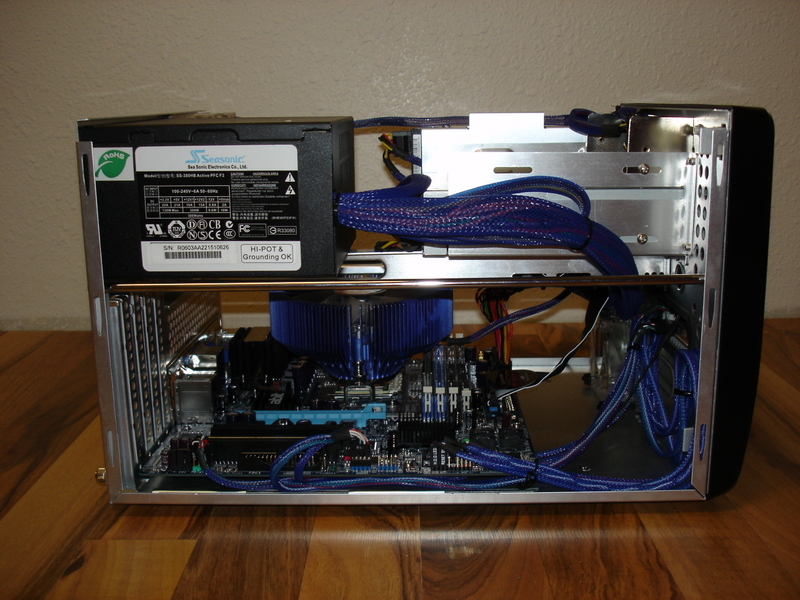 As you can see from the construction of this case, it is made from very sturdy materials. Primarily constructed from 3mm Aluminium sheets (not plastic), it has no sharp edges and is extremely solid and also very heavy, this case weighed 30Kg before I installed the computer components. After I had finished constructing the computer it weighed 36Kg. 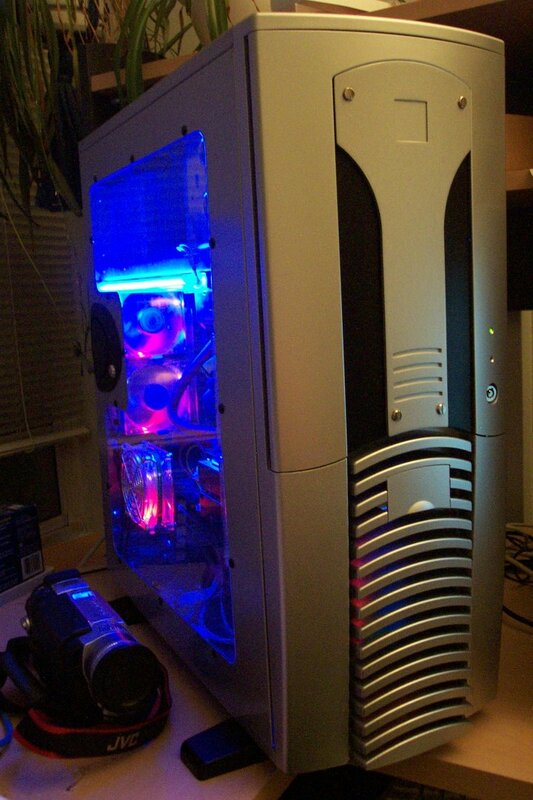 This case was selected in part for its aesthetics’ because it is situated in my living room and I did not want a cheap plastic box there, but also because it houses a machine that has an EATX board along with sophisticated graphics hardware for gaming purposes. But this machine and it’s housing highlights a significant fact. As I mentioned at the beginning of this article your PC is and can be as individual as you. It’s form follows it’s function and as such what you choose and the function you want your machine to perform can dictate not just the components you put in it, but the very shape of it. Just to finish off, I want to highlight what the physical differences are in the hardware. I’ve discussed ITX, Micro ATX and ATX form factors, but it is difficult to relate those acronyms to the actual size differentials that are implied by the acronym’s. Hopefully this diagram will help. A Pen has been added to the image to help with the sense of scale. A very useful guide to the differences in size.